Another fantabulous week of #AMonthofFaves, y'all! Tanya Patrice and Tamara have been kicking tail this week, so make sure you've checked out their posts AND the posts that are linked up each day! While it's not #AMonthofFaves-related, this video was one of my favorite things this week. Huffington Post Women sent this video of things women hear but men never will through my Facebook feed, and it hit alllll the way home. Watch 80 years of subtle sexism in under two minutes. Elizabeth from Silver's Reviews introduced me to some new authors! Not only did Bryan from Still Unfinished mention some great new-to-him authors, he also reminded me to check out the Free Library of Philadelphia on Overdrive. Sara's Book Shelves took a great approach to Helpful Blogging Resources with a list for the NON-Tech Savvy! Guiltless Reading had some great tips for tools and inspiration in her "This is How I Blog" post. Stacy from The Novel Life made me want ALL THE THINGS in her "5 Must-Haves for Winter Survival." Especially the blog planner. Rawwwr! Outside of #AMonthofFaves, Heather from Capricious Reader, did a great review of The Dead Ladies Project by Jessa Crispin and issued herself a challenge! We love a good personal challenge, don't we? Finally, another favorite thing of mine this week is the Podcast app on iPhone! I'm so glad there's an app for podcasts right on my phone's home screen since the last update I did. I'm eating up all the podcasts on my way to work every day since I have that little icon to remind me! Don't forget to link up your own faves below or let us know if you're sharing some other kinda way today! Thanks so much for the shout-out! 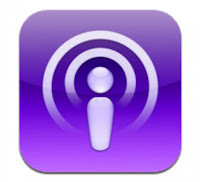 And - I love the podcasts app - use it all the time! I'm sharing my faves on Twitter today. Well that was infuriating! Especially the last one. How rude. All of it. Yay podcasts! You have to tell me what you've been listening too! Isn't it??? And who HASN'T heard at least some of that?? David is totally hooked on Serial. I'm still being all books all the time. And The History Chicks. Love them. He loves them, too, actually. Yep, that's pretty much what I said. Thanks for the mention here. Honored to be included. The Free Library of Philadelphia is free only for Pennsylvania residents and $50 for out-of-state residents. However, other states might have a resource similar to FLP, although I'm not sure. FLP has a foundation that helps support it in addition to (as always limited) state funds. For those in Pennsylvania, it's a great resource and OverDrive is available across the country and while it might not be perfect for everyone, I haven't had many problems with it. Good thing about FLP is that they have lots of copies on new books, but sometimes the waiting time is still pretty long. For backlist books, though, very little wait and lots and lots of series, including many children's books. It would probably totally be worth the $50/year. My local library is just terrible, and unless their Overdrive has grown a lot, that's not even much of a supplement. I'm so tempted to thoroughly check out the podcast app. I listen to Serial, but I'm afraid to get hooked on something else, lol. Thanks for the shoutout, Andi Misetletoe!